Sprints are high impact, high intensity exercises. Being that they are so labor intensive, they burn a high amount of calories when you do them, and they also trigger a higher metabolism once you have wrapped up your workout. This is called the excess post-exercise oxygen consumption, or EPOC for short. 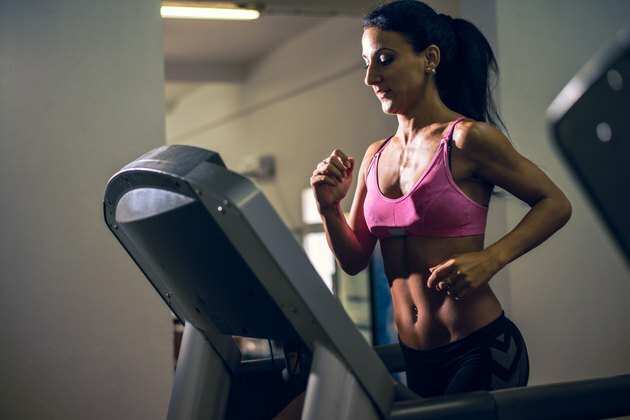 If you are a fan of indoor exercise, climb aboard the treadmill to perform sprints. Step onto the sides of the belt on the treadmill and start the machine. Place one foot at a time on the belt and start walking briskly. Increase your pace slowly to get your heart rate acclimated. Get to a point that you are breaking a good sweat and your breathing is slightly labored. Remain at this pace for about five minutes. Press the up arrow on the console repeatedly as you break into a sprint. Run as fast as you can for 20 seconds. Grab the handrails and lift your body into the air. Place your feet back on the sides of the belt and watch the timer on the console. Rest for 40 seconds, press down on the handrails and lift your body back in the air. Lower your feet back onto the belt and go back into a sprint. Lift your hands off the handrails once you are back in stride and run for 20 seconds. Place your hands back on the handrails, lift yourself back up and place your feet back on the sides of the belt. Repeat your sprint intervals. Aim for eight to 10 sprints when you first start out. Take at least one day off in between your workouts to recover and add one sprint to your workouts each week until you can do 15 or more. Finish up with a light cool-down. Slow down the treadmill to a moderate jogging pace and remain there for two or three minutes. Reduce the speed again to a brisk walking pace and continue to slow down the speed until you are walking slowly. Remain at this pace for two or three minutes. The 20-second sprints depicted in this article are only examples. If you are new to sprint training, you may want to start out with 10 seconds. Whatever times your use, rest for twice as long. Sprint training is very intense. Do not attempt it if you have a heart condition or joint issues. If you are new to exercise, make sure you talk to your doctor before starting a new exercise program.